When contemplating German food, one conjures up images of Oktoberfest and all the stereotypes that accompany the famous festival. Men in lederhosen singing on top of long wooden tables, heaps of bratwurst and sauerkraut, and massive steins overflowing with ale served by beautiful young maidens are de rigueur. As stereotypes go, they’re not so bad. However, German cuisine exists beyond the early weeks of October as well. For the denizens of Saigon who wish to explore the hearty world of German gastronomy, Brotzeit (Kumho Link, 39 Le Duan, D1), a high-concept restaurant chain from Singapore, offers a great place to get started. My companion, who is of German descent, and I sauntered in on what we thought would be a quiet weeknight to see how well it measured up. What we found was a bar and eatery filled with folks from the German Business Association drinking and cavorting at decibel levels not quite rivaling those of an Oktoberfest celebration, but enough to display just how lively Brotzeit can get. We were greeted promptly and warmly by one of their managers, Daniel, who made sure we had two half-liters (VND121,000 each) of Paulaner draught beer, one dark and one blonde, both unfiltered. Filtered versions are also available as are full liters (VND242,000), and 300mL glasses (VND79,000). The dark unfiltered one was unquestionably my favorite, but all are worth a try. With beers in hand we started making our way through a surprisingly extensive menu that includes salads, pizzas and dessert in addition to traditional fare. We opted to begin with a fresh pretzel (VND39,000) and an order of deep fried emmental cheese. 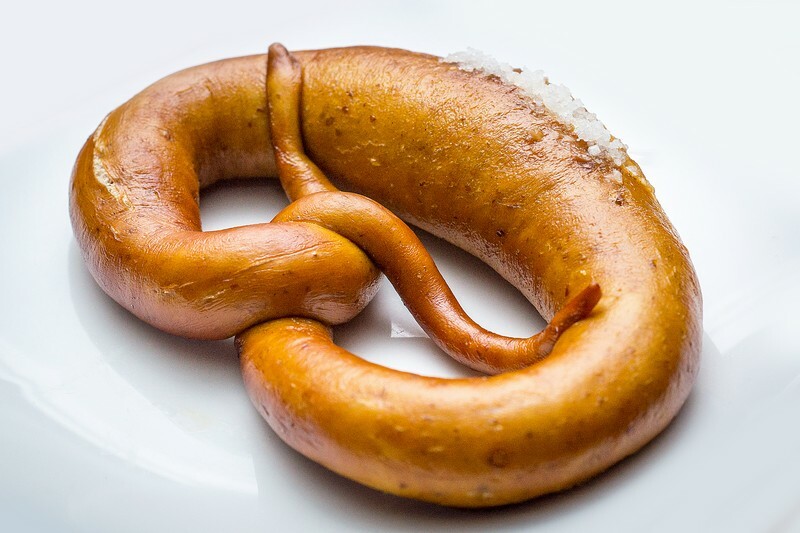 Brotzeit bakes its own pretzels and bread, so there is no questioning freshness. Soft and encrusted with the right amount of salt, the pretzels beg to be doused with tangy mustard for every bite. Sharing works, but only amongst the closest of friends. The portion of emmental cheese is quite satisfying and served with a dipping sauce concocted from cranberries and cream, which provided a fun and unexpected contrast. Of course, the cheese went well with the mustard, too. If there are two things the world can always enjoy more of, it’s mustard and cheese. With many wonderful offerings on the menu, I insisted we also sample some sausage in addition to a few dishes that were recommended by our host as well as my companion. In what proved to be an overwhelming amount of food, we ordered the smoked pork sausages (VND230,000), sauerbraten (VND285,000), and the oven roasted pork knuckle (VND450,000). 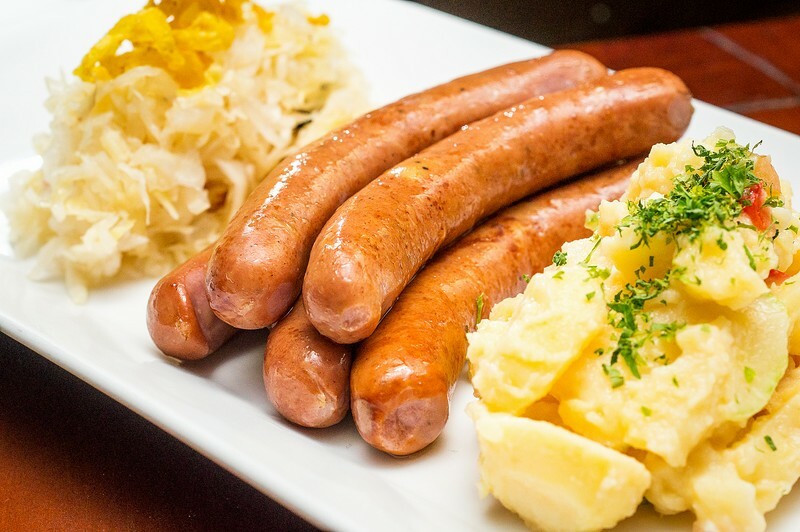 The smoked sausages, imported from Germany, were served with German potato salad and sauerkraut. I find German potato salad to be the best of all potato salads. Brotzeit’s version is mild, but very tasty. The sauerkraut, also imported from Germany, is aged well and not the least bit dry, although a bit on the mild side. The sausages were spot on and had the right amount of snap to them. Dipped in mustard, they are every bit what I hoped they would be. Sauerbraten, which my companion was keen to try right from the jump, was fantastic. 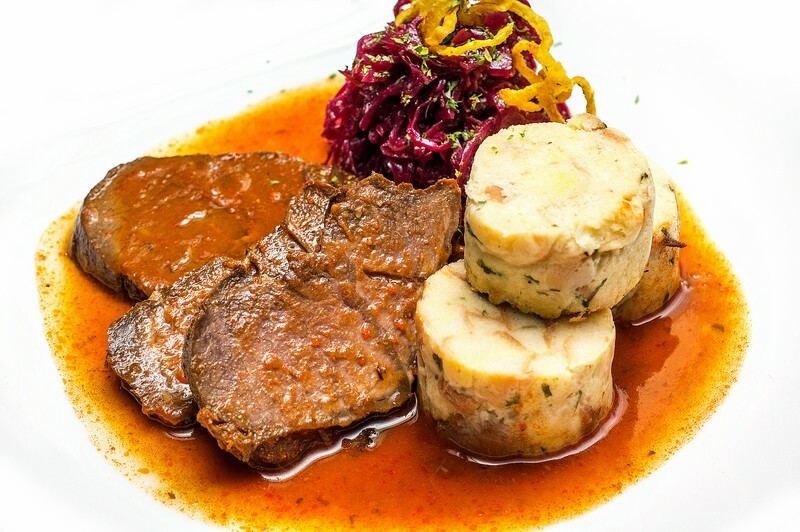 Using imported American beef, Brotzeit’s sauerbraten is braised, slow roasted, and smothered in thickened red wine gravy, accompanied by a mound of stewed red cabbage and napkin dumplings. Everything about this dish will bring people back for another twirl on the dance floor. The beef is tender and savory, the cabbage very tender, and the napkin dumplings are excellent. They also help to sop up the extravagant amount of gravy. 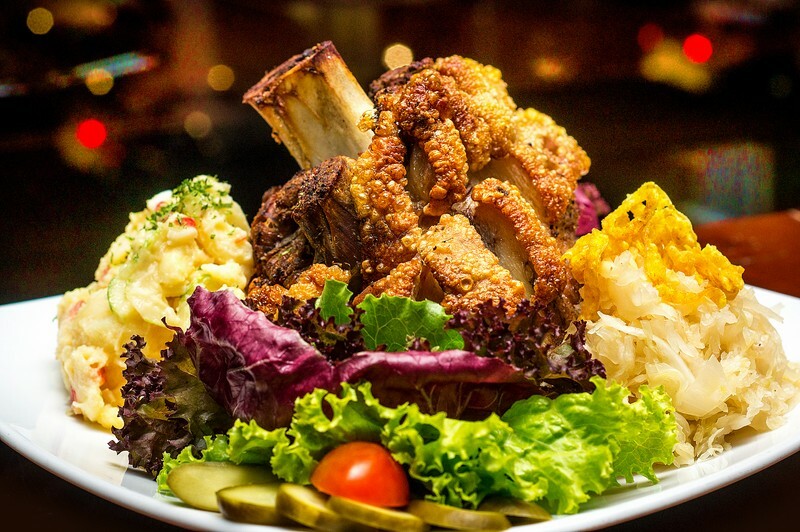 Nothing prepared me for the arrival of the oven roasted pork knuckle, which happens to be Brotzeit’s signature dish. Coming with generous sides of sauerkraut and potato salad, this menu item is not meant for one person, no matter how voracious an appetite; it’s monstrous. They serve it with gravy made from braising pork bones, and there’s plenty to make sure every bite gets a dab. Although, you should make sure to order up some extra mustard because this piggy likes to roll around in that, too. The meat itself is tender and juicy, while the skin and rinds are crispy and crunchy, providing a great contrast in textures. There is seemingly no end to the amount of meat one can cut off the knuckle, as you will find it clinging to the bone everywhere. This should be enough to satisfy two people, or perhaps four who are looking for an ambitious bar snack. For those looking to try German food that isn’t just sausages and pretzels, or if you’re simply in the mood for some Oktoberfest fare during the middle of summer, Brotzeit can accommodate (although Daniel admitted they are going to celebrate Oktoberfest this year). They’re also equipped with plenty of large screens to watch soccer matches, particularly those with German rooting interests, so it doubles as a place to view a good game. With a new location looking to open up in District 2, Saigon should be able to get plenty familiar with one of the heartiest of cuisines for some time to come. Brotzeit will be celebrating Oktoberfest on October 2 & 3 with a German buffet and free flow of imported German beer for VND1,650,000 per person.